Join the Dept. 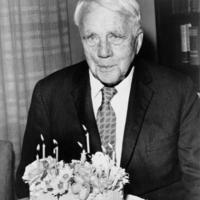 of English & Creative Writing and the Crossroads Academy 7th grade for a celebration of Robert Frost's Birthday in Sanborn Library on March 26th, 2019 at 6:30pm. Join the Dept. of English & Creative Writing and the Crossroads Academy 7th grade class in celebration of Robert Frost's birthday for "You Come Too": A Robert Frost Reading. Bring a favorite Frost poem to read aloud, or come to listen and enjoy! The event will be held in the Sanborn Library the evening of March 26th, 2019 from 6:30 to 8:00pm. Guests are welcome to share . . . This event is free and open to the public, and celebratory refreshments will be provided. The Sanborn Library is located on the first floor of Sanborn House, 19 N. Main Street, Hanover NH. The main entrance to Sanborn House can be seen to the left of the Baker Library entrance when facing the bell tower from the Dartmouth green.